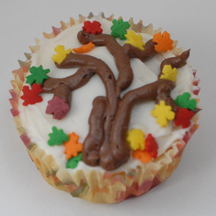 For Thanksgiving or any fall party, consider these easy trees complete with autumn leaves. You’ll need a pastry bag and leaf-shaped sprinkles, which can be found in those multi-pack, seasonal sprinkle containers at grocery stores, or year-round and baking supply stores. What You Need: 1 cupcake; white or off-white icing; chocolate icing; leaf sprinkles; pastry bag; round metal tip (#3 is good). How to Make It: Frost cupcake. Fill pastry bag halfway with chocolate frosting and attach tip and coupler. Squeeze lines to make a tree trunk and branches. Then, either sprinkle on leaves or place them deliberately. This entry was posted on Wednesday, November 26th, 2008 at 4:27 pm	and is filed under Uncategorized. You can follow any responses to this entry through the RSS 2.0 feed. Responses are currently closed, but you can trackback from your own site.